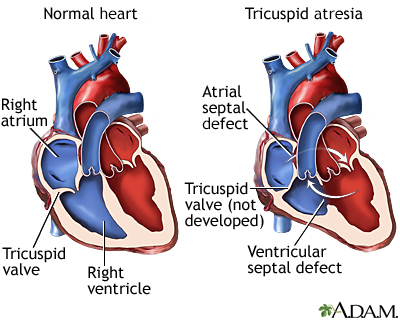 Tricuspid atresia is a type of heart disease that is present at birth (congenital heart disease), in which the tricuspid heart valve is missing or abnormally developed. The defect blocks blood flow from the right atrium to the right ventricle. Other heart or vessel defects are usually present at the same time. Tricuspid atresia is an uncommon form of congenital heart disease. It affects about 5 in every 100,000 live births. One in 5 people with this condition will also have other heart problems. Normally, blood flows from the body into the right atrium, then through the tricuspid valve to the right ventricle and on to the lungs. 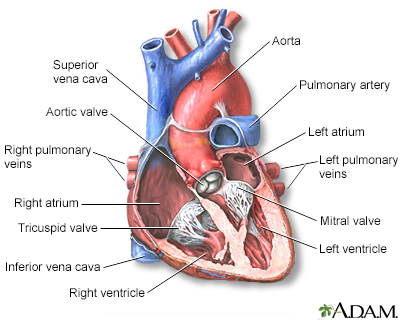 If the tricuspid valve does not open, the blood cannot flow from the right atrium to the right ventricle. Because of the problem with the tricuspid valve, blood ultimately cannot enter the lungs. This is where it must go to pick up oxygen (becomes oxygenated). Instead, the blood passes through a hole between the right and left atrium. In the left atrium, it mixes with oxygen-rich blood returning from the lungs. This mix of oxygen-rich and oxygen-poor blood is then pumped out into the body from the left ventricle. This causes the oxygen level in the blood to be lower than normal. In people with tricuspid atresia, the lungs receive blood either through a hole between the right and left ventricles (described above), or through maintenance of a fetal vessel called the ductus arteriosus. The ductus arteriosus connects the pulmonary artery (artery to the lungs) to the aorta (main artery to the body). It is present when a baby is born, but normally closes by itself shortly after birth. This condition may be discovered during routine prenatal ultrasound imaging or when the baby is examined after birth. Bluish skin is present at birth. A heart murmur is often present at birth and may increase in loudness over several months. Once the diagnosis is made, the baby will often be admitted to the neonatal intensive care unit (NICU). A medicine called prostaglandin E1 may be used to keep the ductus arteriosis open so that blood can circulate to the lungs. Generally, patients with this condition require surgery. If the heart is unable to pump enough blood out to the lungs and rest of the body, the first surgery most often takes place within the first few days of life. In this procedure, an artificial shunt is inserted to keep blood flowing to the lungs. In some cases, this first surgery is not needed. Afterward, the baby goes home in most cases. The child will need to take one or more daily medicines and be closely followed by a pediatric cardiologist. This doctor will decide when the second stage of surgery should be done. The next stage of surgery is called the Glenn shunt or hemi-Fontan procedure. This procedure connects half of the veins carrying oxygen-poor blood from the upper half of the body directly to the pulmonary artery. The surgery is most often done when the child is between 4 to 6 months old. During stage I and II, the child may still look blue (cyanotic). Stage III, the final step, is called the Fontan procedure. The rest of the veins carrying oxygen-poor blood from the body are connected directly to the pulmonary artery leading to the lungs. The left ventricle now only has to pump to the body, not the lungs. This surgery is usually performed when the child is 18 months to 3 years old. After this final step, the baby's skin is no longer blue. In most cases, surgery will improve the condition. There is no known way to prevent tricuspid atresia. Fraser CD, Kane LC. Congenital heart disease. In: Townsend CM Jr, Beauchamp RD, Evers BM, Mattox KL, eds. Sabiston Textbook of Surgery. 20th ed. Philadelphia, PA: Elsevier Saunders; 2017:chap 58.